The weekend before Halloween I spent most of a cold and dark Saturday watching Alfred Hitchcock movies. Included in my Hitchcock marathon were Rear Window, North by Northwest, Vertigo, The Rope, The Birds and of course, Psycho. Since then I’ve become equally suspicious of all my neighbours, high places, crop-dusting planes, birds and especially showers. Hitchcock, due for release on November 23, follows Hitchcock (played by Anthony Hopkins) and his wife Alma Reville (Helen Mirren) during the time when the legendary director struggled to get the movie Psycho made. The movie also stars Scarlett Johansson as Janet Leigh, Toni Collette as Hitchcock’s production assistant Peggy Robertson, and James D’Arcy as the original ‘mother-lover’, Anthony Perkins. 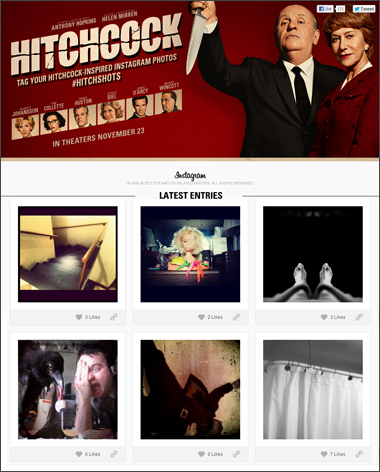 To promote the movie’s release, Searchlight Pictures have launched the Hitchshots photo contest. 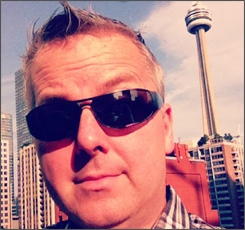 To enter, participants post their best Hitchcock-inspired Instagram photos with the hashtag #hitchshots. The 10 photos which receive the most amount of shares and likes (I assume, just on Instagram), will win their owner an autographed poster showcasing the movie’s all-star cast. I’m not a fan of using ‘likes’ and ‘shares’ as a the method of choosing a winner, since Instagram users with large audiences easily receive hundreds of likes’ for nearly anything they post.